We were going to the beach this morning and were talking about collecting shells when I had a blast from the past. 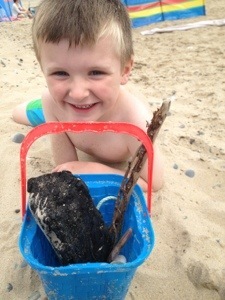 I mentioned the words “scavenger hunt” and Ciarán started asking questions. 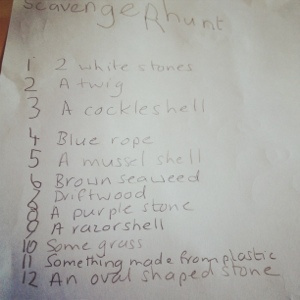 So he got a piece of paper and wrote “Scavenger Hunt” on the top. I tried to come up with a list that would most likely be available but not too easy. The inclusion of the “oval stone” was designed to make them think about shapes, different numbers of things to count, different colours. It’s a perfect activity for 5-6 year olds as Ciarán was thrilled to be able to read it. The minute we got to the beach he took it out and started looking for the items, and we found all but two quite easily, the razor shell and cockle proved elusive but we got them in the end. We’ve already discussed doing a version for a walk in the woods. The beauty of this beach activity is that it’s not weather dependent, it’ll work just as well in the middle of winter. Activity, Beach, summer, winter. Bookmark. I love scavenger hunts- we did one at D’s birthday party last summer- not sure who was more competitive, the kiddies or their parents!!!! There were people running around our garden like lunatics trying to find all the items on our list-hilarious! We usually use pictures of the things to find on our lists. V. Cute photos. Must try your list on the beach over the next day or two! Given I live beside the beach I must try this! Thanks.